Background: A wide variety of biological activities are exhibited by N, O and S containing heterocycles and recently, many reports appeared for the synthesis of these heterocycles. The synthesis of heterocycles with the help of metal and non-metal catalyst has become a highly rewarding and important method in organic synthesis. This review article concentrated on the synthesis of S-heterocylces in the presence of metal and non-metal catalyst. The synthesis of five-membered S-heterocycles is described here. Objective: There is a need for the development of rapid, efficient and versatile strategy for the synthesis of heterocyclic rings. Metal, non-metal and organocatalysis involving methods have gained prominence because traditional conditions have disadvantages such as long reaction times, harsh conditions and limited substrate scope. Conclusion: The metal-, non-metal-, and organocatalyst assisted organic synthesis is a highly dynamic research field. For ßthe chemoselective and efficient synthesis of heterocyclic molecules, this protocol has emerged as a powerful route. Various methodologies in the past few years have been pointed out to pursue more sustainable, efficient and environmentally benign procedures and products. Among these processes, the development of new protocols (catalysis), which avoided the use of toxic reagents, are the focus of intense research. 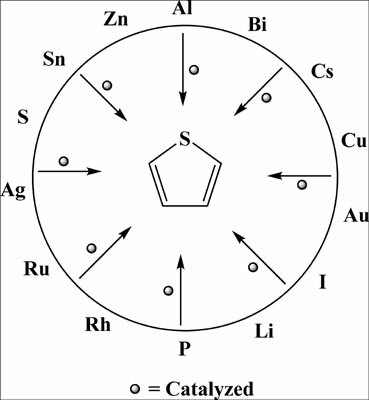 Heterocycles, sulfur, synthesis, metal, non-metal, catalyst.